Notice: This product was discontinued on Mar 31, 2019. When combined with Yokogawa's turnkey PC software, the MX100's multi-channel capability and high isolation voltage offers the ultimate in measurement power. Shortest measurement interval of 10 ms (high-speed measurement of 10 ms on 24 channels or 100 ms on 60 channels is possible). Possible to acquire data from up to 1,200 channels (when using Yokogawa's proprietary software). Reinforced insulation between the input terminal and the case handles 3700 Vrms for one minute, or 600 Vrms/VDC continuous. Mixed use of three types of measurement intervals is enabled within the system (measurement intervals are set for each module). By configuring modules, a system can be built or modified to utilize 4 to 1,200 channels, and measurement intervals of 10 ms to 60 s.
Software developed by Yokogawa, an API, and a LabVIEW driver are available. 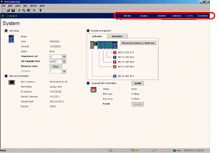 PC software developed by Yokogawa automatically identifies any connected MX100s. 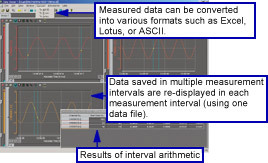 The relationship between measurement intervals and the number of channels largely depends on the performance of the PC. The actual performance may differ from that shown in the table. Three types of measurement intervals can be used in a single system in various combinations. 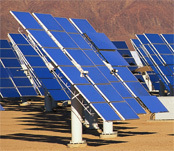 Measurement intervals are specified for each module. It is also possible to set different types of input modules to the same measurement interval or to set the same type of input modules to different measurement intervals. Twelve measurement intervals are available as userselectable options: 10 ms, 50 ms, 100 ms, 200 ms, 500 ms, 1 s, 2 s, 5 s, 10 s, 20 s, 30 s and 60 s. Please note, however, that measurement intervals of 10/50 ms cannot be set to the Medium-speed Universal Input Module (MX110-UNV-M10). Multi-interval systems can be flexibly built for each module as shown in the figure below. Three colors are used to indicate the three types of measurement intervals. The window shows measurement values by measurement intervals. Measurement can be performed while confirming rapidly-changing signals and slowly-changing signals simultaneously. Reinforced (double) insulation has been provided between the input terminals and the case to achieve a high withstand voltage of 600 Vrms/VDC (continuous). As shown below, each battery voltage can be measured even if the batteries are stacked to increase common-mode voltages. MX input modules employ integrating A/D converters with superior noise rejection performance. In particular, the MX110-UNV-H04 Four-Channel High-Speed Universal Input Module incorporates an integrating A/D converter for each input channel, thereby exhibiting strong noise rejection performance in high-speed measurement. Moreover, the digital filtering function is effective on noises that cannot be fully rejected even with integrating A/D converters. Time constants can be selected from 5 to 100 measurement interval times. Therefore, filtering can be applied according to the noise to be rejected. When the noise source in the left figure was applied to the MX, the result in the right figure was obtained. High-speed measurement can be stably performed even in noisy environments. Measurement with the range of 2 V (-2 V to +2 V), measurement interval of 50 ms, integral time "Auto" and filter & "OFF." One MX unit enables data acquisition on up to 24 channels at a measurement interval of 10 ms, or up to 60 channels at a measurement interval of 100 ms (six modules installed in both cases). The MX and PC are connected via a hub and a straight Ethernet cable. Alternatively, they can be connected using a cross cable alone, without using the hub. In a one-to-one connection, the MX100 standard software included with the main module facilitates easy building of data acquisition environments. One MX unit consists of a combination of a main module, input/output modules, and a base plate. This configuration centers on the main module. 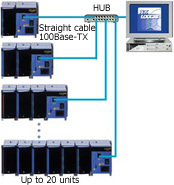 The MX units and the PC are connected by means of a hub and straight Ethernet cables. Acquisition of data from multiple MX units is well-supported by Yokogawa's software "MXLOGGER" (optional). MXLOGGER enables data acquisitions of up to 20 MX units (one unit has inputs of up to 60 channels, or 1,200 channels on 20 units). Please note that the shortest measurement interval of MXLOGGER depends on the system's total number of channels and the PC's performance. If users wish to create their own data acquisition software, there is no limit to the number of MX units that can be integrated with a single PC software element. Please note, however, that if conditions with heavy loads (such as short measurement intervals with many units) are set to the PC and its software, data will not be acquired in time and some data may be lost. MX110-UNV-H04 4 10 ms DC voltage, thermocouple, 3-wire RTD, DI (non-voltage contact, Level (5 V logic)). Mixed input allowed. MX110-UNV-M10 10 100 ms DC voltage, thermocouple, 3-wire RTD, DI (non-voltage contact, Level (5 V logic)). Mixed input allowed. MX110-V4R-M06 6 100 ms DC voltage, 4-wire RTD, 4-wire resistance, DI (non-voltage contact, Level (5 V logic)). Mixed input allowed. MX115-D05-H10 10 10 ms Non-voltage contact, open collector, and Level (5 V logic). Mixed input allowed. Base plates available for all configurations, from 1 to 6 input/output modules. When used for the MW100/MX100, you must replace the attachment with the one that comes standard with the MW100/MX100. AC Adapter (772075) AC adapter for the DC power model. All input/output terminals are removable except for those of the MX112-NDI-M04. If multiple terminals are prepared ahead of time, no re-wiring is needed between measurements. Screw (M4) terminal block (RJC (reference junction compensation) included). For use in combination with 772062. Compatible with MX110-UNV-M10, MX115-D05-H10, and MX115-D24-H10. Connection cable between input modules and the screw terminal block. Compatible with MX110-UNV-M10, MX115-D05-H10, and MX115-D24-H10. Plate with clamp terminals (RJC included). Compatible with MX110-UNV-M10, MX115-D05-H10, and MX115-D24-H10. Clamp terminals. Compatible with MX110-UNV-H04. Clamp terminals. Compatible with MX120-VAO-M08, MX120-PWM-M08, and MX125-MKC-M10. Plate with clamp terminals. Compatible with MX110-V4R-M06. Plate with clamp terminals (Built-in bridge resistance of 120 ohm). Compatible with MX112-Bxx-M04. Plate with clamp terminals (Built-in bridge resistance of 350 ohm). Compatible with MX112-Bxx-M04. Plate with screw (M3) terminal (RJC included). Compatible with MX110-UNV-M10, MX115-D05-H10, and MX115-D24-H10. Use the DIN rail for mounting on on racks or panels. The DIN rail can be easily attached using the dedicated bracket. Two brackets come standard with the base plate (MX150). Use the DIN rail for mounting on racks or panels. The DIN rail can be easily attached using the dedicated bracket. Two brackets come standard with the base plate (MX150). 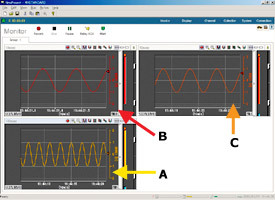 This software is used to connect a single MX unit for performing data acquisition (it is not possible to connect multiple MX units). It includes three software elements: the integration monitor, viewer, and calibration. This software performs real-time monitoring and logging of measured data. 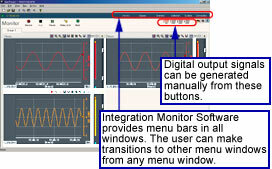 It consists of six menus: Monitor Window, Detailed Display Setting, Channel Setting, Acquisition Condition, System Setting, and Connection/disconnection. 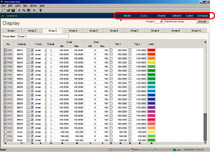 This menu is used to set various conditions (such as measurement intervals/data save intervals, measurement start/end conditions, or file name designation) for data acquisitions. This menu is used to decide module configurations, etc. 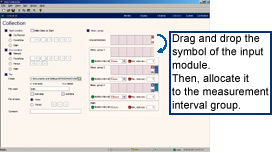 Module configurations are shown in easily understood diagrams. 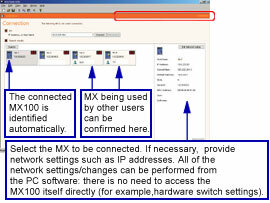 The connected MX100 is identified automatically. Once connection setting information is provided, it will be retained. When the system restarts, the MX100 will be connected automatically without making network settings. This software is intended to efficiently carry out the calibration of universal input modules. 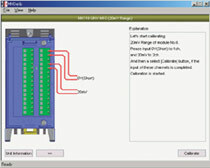 MXLOGGER is used to connect multiple MX units (up to 20 units) for data acquisition (one MX unit can also be connected). It consists of software elements (setting, logger (for saving data), monitor, and viewer) and the monitor server. 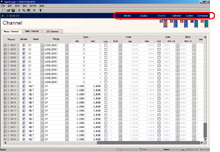 The monitor server function is used to enable connections with Yokogawa's data logging software, "GA10." 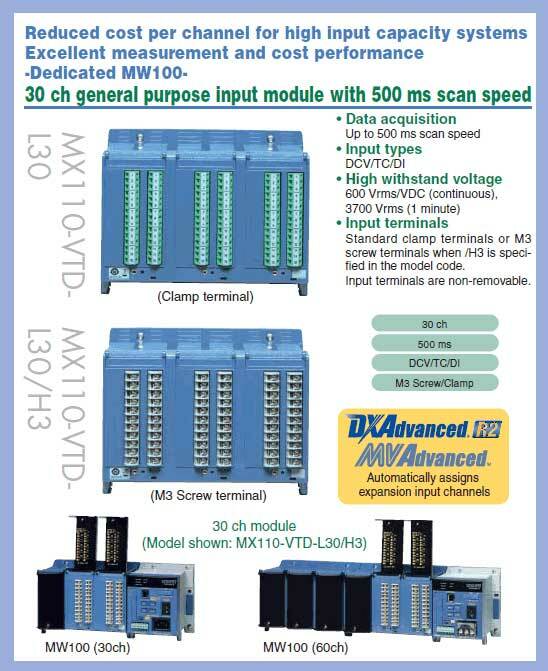 It is effective when combining MX units with Yokogawa's data acquisition equipment such as DARWIN and DAQSTATION. If users wish to create their own data acquisition software, please use this API. The API consists of a suite of functions to communicate with MX100/DARWIN. The suite of functions contains DLL (dynamic link library). API makes it possible to create data acquisition software dedicated to the MX, or data acquisition software combining the MX and DARWIN, or data acquisition software dedicated to DARWIN. Three languages (Visual C, Visual C++, and Visual Basic) are supported. list of compatible models which various PC software is supported. Rinnai uses the MX100 PC-based High-speed Data Acquisition Unit for evaluation and testing of its kitchen appliances. 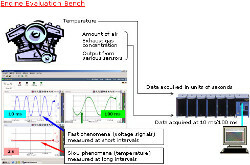 Denso uses the MX100 PC-Based High-Speed Data Acquisition Unit for performance evaluation of its car air conditioners. In durability testing of engines, revolutions and load control signals are applied and the results are acquired on a recorder. Using the MX100's AO (analog output) module, you can record data while simultaneously applying control signals. Simultaneous measurement of various types of signals is not an uncommon task on test benches and durability test benches. DAQMASTER's Multi-Interval Function is effective in such situations.